Beautifully engraved certificate from the WorldCom, Inc.- MCI Group. This historic document was printed by the Security-Columbian United States Banknote Company and has an ornate border around it with a vignette of the company name. This item has the printed signatures of the Company's President, Bernard J. Ebbers and Secretary, Scott D. Sullilvan. July 21, 2002 � WorldCom Inc. filed for Chapter 11 bankruptcy protection according to the company's chief executive John Sidgmore. The bankruptcy is the largest in U.S. history and the latest in a spectacular series of corporate collapses. The filing took place in U.S. Bankruptcy Court in Manhattan, and it ensures that the company receives about $2 billion in financing while it reorganizes. WorldCom�s MCI Group is traded as a tracking stock. The MCI Group includes WorldCom's consumer and small-business services including the long-distance services. Inquiries into the company's accounting practices in 2002 led to the resignations of WorldCom's CEO and CFO and the filing of fraud charges by the SEC. The company plans to eliminate the tracking stock structure in July 2002. 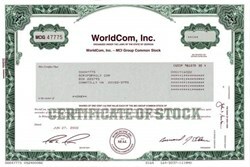 6/25/2002 6:40:44 PM NEW YORK, June 25 - Shares of WorldCom (WCOM) sank like a rock in after-hours trade on Tuesday following a news report that the beleaguered telecommunications giant has allegedly engaged in massive fraud that may force it to file for bankruptcy. CLINTON, Miss. April 30, 2002 � Bernard J. Ebbers, who built WorldCom Inc. into a global telecommunications giant but then saw its fortunes and stock price crumble amid fierce industry competition and questions about the company's finances, has resigned as chief executive and president. WorldCom said Tuesday that vice chairman John Sidgmore would succeed Ebbers in both positions. Bert Roberts remains chairman.